Bolivian writer (and Houston resident) Rodrigo Hasbún is a writer with startling skills. In 2010 he was listed by Granta as one of the twenty best writers in Spanish under the age of 35. 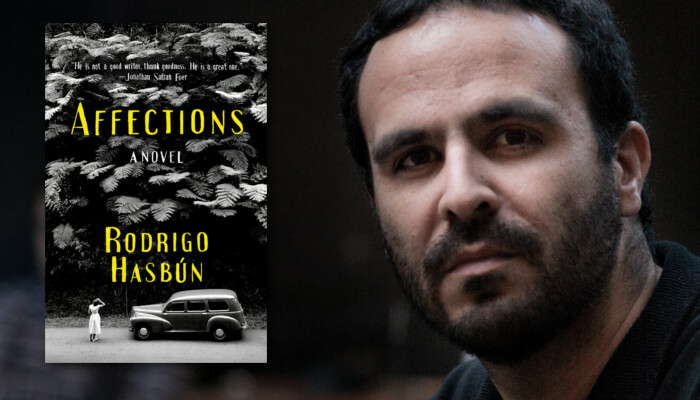 His English-language debut, AFFECTIONS, is coming out this month and we’re all excited to see Rodrigo read and discuss this remarkable novel on Tuesday September 12th at 7 PM. AFFECTIONS is a fictional account of real-life German cameraman Hans Ertl and his family. A well-known cinematographer for the Nazis, Hans moved his family to La Paz in the 1950’s. What follows is a subtle and melancholic story, narrated by different members of the Ertl family, mainly Hans’ three daughters, Heidi, Monika and Trixie. The novel moves swiftly, the reader seeing what true displacement - from a culture, a language - feels like. Divided roughly in half, the first half focuses on Hans’ desire to find and film the ruins of Incan city Paitit. The second half takes place ten years later amidst the backdrop of revolution. Told in short, sparse chapters, AFFECTIONS is one of the best novels I have read this year, replete with guerilla fighters, revolutionaries and quixotic filmmakers. It is also filled with subtle surprises, especially what Hasbún chooses to focus on and what he chooses to ignore. A moving and meditative book on a family torn apart by the winds of revolution and history, AFFECTIONS will hopefully prompt Hasbún’s other books to be translated into English. AFFECTIONS comes out September 12 from Simon & Schuster. Join us that day for the release of his book at Brazos Bookstore! The event will begin at 7pm. Hasbún will be joined by translator Sophie Hughes.